Remodeling a kitchen is not a home improvement project for the faint of heart. Kitchen remodeling costs are prone to spiral, and the number of choices for new cabinets, kitchen countertop materials, and lighting can be overwhelming for a homeowner working with an inexperienced contractor. The Boston general contractors on our list can offer kitchen remodeling ideas that maximize precious space for gathering, entertaining, and, of course, cooking. With the Boston Design Center at their disposal, New England kitchen remodelers and their clients have many more resources at their fingertips than Pinterest. The firms below are ranked on the basis of exceptional customer service, implementation of unique design solutions, and long lists of industry accolades. A South Shore general contractor since 1991, Duncan Kitchen & Bath operates a Hanson showroom stocked with custom and semi-custom kitchen remodel features. The company, a member of the National Kitchen and Bath Association, is an expert in the planning, design, and installation of new kitchens and bathrooms. From putting the final polish on new countertops and faucets to installing efficient electrical and plumbing systems, Duncan Kitchen & Bath offers a full suite of services necessary for a successful remodel. Salem State University graduate Debbie Duncan has managed the showroom since 1999. As the client liaison, Debbie has helped foster the firm’s reputation for attentive customer service, transparency, and flawless execution. Each design and build kitchen project begins with either computer renderings or hand drawings developed until the client’s specifications are met. Homeowners who have worked with the Duncan Kitchen & Bath team laud the company for flexible processes that allow for design changes, expert knowledge of materials and installation strategies, and careful selection of sub-contractors. The team remodels kitchens in Sandwich, Whitman, Pembroke, and the surrounding communities. Founder, principal, and company president Chris Rapczynski established Sleeping Dog Properties in 1993. During their 25 years in business, the South End general contractor has fielded more than $200M in construction projects, many of them luxury renovations and build-outs of homes in upscale neighborhoods throughout Boston. When it comes to kitchen remodeling, this Boston general contractor is experienced in designing and hanging custom cabinets and installing energy-efficient lighting programs. The team is happy to partner with architects and interior designers to achieve a client’s dream kitchen results. Sleeping Dog Properties’ projects have been featured in New England Home and have landed on the cover of Interiors magazine. Affiliated with the Association of General Contractors and the American Institute of Architects, the firm emphasizes on-time project completion, lasting client relationships, and vigorous attention to detail. Among their accolades for residential renovations and new construction is a Best of Show distinction from the International Interior Design Association New England chapter for a new home in Newton. The diverse skill sets of Sleeping Dog Properties project managers and craftsmen make the team successful at Millennium Tower condominium outfits and elegant townhouse renovations. The firm also offers construction and renovation services for boutique commercial projects. Boston general contractor Bay State Refinishing & Remodeling has performed high-end kitchen and bathroom renovations since 1999. The team works on interior remodels throughout Cambridge, Brookline, Newton, Wellesley, and the surrounding communities. Better Business Bureau-accredited with an A+ rating, Bay State Refinishing & Remodeling has earned numerous awards for outstanding customer service. Project managers encourage clients to come on showroom visits, so homeowners can see and touch the high-quality finishes that will complete their kitchen renovation projects. In this Newton contemporary renovation, the closed, outdated, separated kitchen and dinning areas were transformed into a clean, modern space. A load bearing wall was removed and a new structural steel beam was installed resulting in a flawless, open concept design that brings more natural light into the kitchen area. Bay State Refinishing & Remodeling offered and executed a 3 phases process which included: design, construction management and remodeling services. The focus of the design was on clean lines and natural color palettes and the choice of the finishes was accordingly: high end Viking appliances, Leicht cabinetry, Azuvi tiles, Duravit fixtures, Kitchler lighting wood flooring and Lava stone counter top. Two separate sinks were installed in the kitchen area, one of them is part of a wet bar that contains a 50 bottles custom made built-in wine cooler. Howell Custom Building Group is a custom builder focusing on high end custom homes, remodels and additions north of Boston, primarily in Essex County. Their projects have been featured in North Shore Home, Arts & Crafts Homes, the Wall Street Journal, and Professional Remodeler. The firm has also provided remodel ideas for HGTV.com. Since husband-and-wife team Stephen and Susan Howell founded Howell Custom Building Group in 1997, the firm has completed more than 700 projects throughout the greater Boston area. 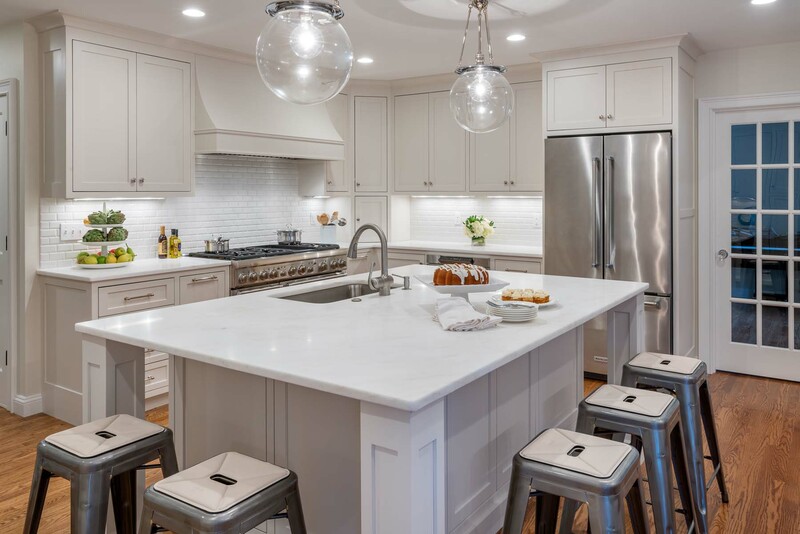 Their work has garnered multiple Builders and Remodelers Association of Greater Boston PRISM Awards, including three for Best Kitchen Remodel. The construction company also earned the distinction of Best of Boston Home High-End Remodeling contractor from Boston magazine. In a PRISM Gold Award-winning remodel, Howell Custom Building Group renovated a dated kitchen in Andover. The team removed a wall to open the kitchen to the family room. French glass pocket doors and built-in shelving frame the new opening. The new kitchen design created space for an ample kitchen island with contrasting dark base cabinets and bright stone countertops. Better Business Bureau accredited with an A+ rating, Harvey Remodeling is a design and build general contractor that specializes in interior renovations, home additions, and new construction. The firm, which also works on clients’ small home improvement projects, has received a Guildmaster Award for outstanding customer service. The Harvey Remodeling story began long before current company president Neil Harvey came on board. His grandfather, Francis Harvey, started the first iteration of the company as a sole proprietor in the 1920s. Francis’s son, Raymond Harvey, took over the company in the late 1950s, building on the firm’s reputation for fine craftsmanship. The Shrewsbury general contractor has earned many Contractor of the Year awards from the Eastern Massachusetts chapter of the National Association of the Remodeling Industry, including two for home additions and one Silver Award for a kitchen renovation with a budget under $50,000. The award-winning project in Holden incorporated high-quality, low-maintenance materials, such as quartz countertops, for a high-end look appropriate for a young family. A Remodeling magazine Big 50 contractor, Charlie Allen Renovations remodels kitchens and baths but also takes on full-house restorations and renovations. The Cambridge general contractor serves the greater Boston area. Their work has appeared in multiple kitchen and bath issues of This Old House magazine, The Boston Globe, Signature Kitchens & Baths, and New England Home. Founder and CEO Charlie Allen has served as chairman of the board of the Eastern Massachusetts chapter of the National Association of the Remodeling Industry (NARI). Allen, a Harvard graduate, leads the company with Julie Palmer, who has served as president of the firm since 2013. She was previously the office manager and director of operations. Since incorporating in 1978, Charlie Allen Renovations has earned nine awards from the Somerville Historic Preservation Commission, six Cambridge Preservation awards, and a handful of NARI Contractor of the Year Gold Awards, including the Kitchen Remodels valued over $150k category. Boston magazine has called Charlie Allen Renovations the Best Restoration Contractor in the city. Divine Design + Build offers kitchen, bath, and full home remodel services throughout Boston and surrounding villages, including Chestnut Hill and Brookline. The firm operates offices and showrooms in Wellesley and right on Boston Harbor, where their in-house designers, architects, and craftspeople meet with clients to plan dream kitchens. Co-founders and owners Mariette and Magued Barsoum established Divine Design + Build in 2004. Mariette, a National Kitchen & Bathroom Association Certified Kitchen Designer, is also the firm’s principal designer. Divine Design + Build has earned dozens of industry accolades, including several for successful kitchen renovations. Signature Kitchens & Baths awarded the firm the 1st Place National Contemporary Kitchens Design award, while the New England chapter of the National Association of the Remodeling Industry recognized Divine Design + Build with Contractor of the Year awards for Best Kitchens with budgets $50,000 to $100k, $100k to $150k, and over $150k. Their work makes regular appearances in Signature Kitchens and Baths magazine, Remodeling Magazine, Metrowest, and Distinctive Kitchen Solutions. Founded in 1978, FBN Construction is a Readville general contractor that offers custom home construction, remodels, additions, exteriors, and ongoing property maintenance. A member of the American Society of Interior Designers and the International Furnishings and Design Association, FBN Construction partners with the most reputable design firms in the greater Boston area, including David Mullen Architect, Hacin + Associates, and LDa Architecture & Interiors. In their 40-year history, FBN Construction has earned multiple Gold PRISM Awards for Best Kitchen and Best Kitchen Between $75,000 and $150k from the Builders and Remodelers Association of Greater Boston (BRAGB). Remodeling Magazine ranked FBN Construction on their Big 50 list of the top remodeling contractors in the country. The firm has also been dubbed a National Remodeler of the Month by the National Association of Home Builders, and Builder of the Year by the BRAGB. Also a recipient of the Luxury Living Award, FBN Construction has brought home recognition for standout team members, such as BRAGB Site Superintendent of Year, Steve Farley. A general contractor in Acton, Kistler & Knapp has built and renovated homes for more than 35 years. The firm’s work has appeared in Builder + Architect magazine, Boston Design Guide, Fine Homebuilding, and Architectural Digest. They have also been featured in the 2015 Kitchen & Bath Design issue of New England Home and the 2016 Kitchen edition of Boston Home magazine. Principals Renee West and Douglas Stevenson lead a team of project managers, project supervisors, carpenters, and technicians in home remodel projects throughout the greater Boston area, including Needham, Concord, Lexington, Westford, and Manchester-by-the-Sea. A custom home builder and remodeler, Kistler & Knapp handles construction budgets in the hundreds of thousands, and up to $10M. The firm maintains affiliations with the Builders and Remodelers Association of Greater Boston (BRAGB), the Home Builders and Remodelers Association of Cape Cod (HBRACC), and the National Association of Home Builders (NAHB), among other design and construction institutions, both national and regional. They also have a Cape & Islands Office at Onset, and a Home Maintenance Division. In 1977, when Finley H. Perry established his eponymous construction company, his daughter, who would eventually become company president and owner, was only five years old. Today, Allison Perry Iantosca leads the firm in high-end construction management and expertly crafted home remodels. For their work throughout Boston, Wellesley, Weston, and beyond, F.H. Perry Builder earned a Preservation Award from the Cambridge Historical Commission. The firm has also been listed as a Boston magazine Best High-end Remodeler, a Professional Remodelers Market Leader, one of the top 100 women-led business in Massachusetts, and a Remodeler of the Year. Working with LDa Architects, F.H. Perry Builder completely gutted and rebuilt the kitchen of a Cambridge home. On a tight schedule, the firms reinvented the space as a contemporary room with warmth for a young family. F.H. Perry Builder has built one or two custom homes in the Boston area but focuses mainly on significant and technically challenging home additions and historic restorations. Their projects have garnered press from The Boston Globe, Boston magazine, Design New England, and Remodeling Magazine. Founded in 1991, Sea-Dar Construction is a general contractor with offices in Boston, Osterville, and New York City. The firm builds fine, custom homes, as well as commercial and institutional projects. President and Founder Jean Abouhamad, professional engineer, holds degrees in structural engineering and civil engineering, from Cornell University and Columbia University, respectively. Sea-Dar Construction has earned Boston magazine Best of Boston awards for Best Kitchen and Bathroom Contractor and Best High-End Remodeler South, as well as multiple accolades from the Boston Preservation Alliance. The Builders and Remodelers Association of Greater Boston has awarded the South End firm with several Gold and Silver PRISM awards for Best Remodeling/Restoration Project valued over $1M. Sea-Dar worked with prominent Boston design firm Hacin + Associates to renovate the kitchen of an historic, Beacon Hill carriage house. The older home suffered from a cramped floorplan and dark rooms. The renovation transformed the kitchen into a clean, light-filled, elegant space. Sleek, white, contemporary cabinetry and stainless steel, high-end appliances bounce natural light around the room. Dale Nikula, a founding member of the National Association of the Remodeling Industry (NARI) Cape Cod chapter, established Dale R. Nikula Co. in 1995. The company has been known as Encore Construction since 2003. Under the care of President and Chief Executive Officer Nikula, the design, build, and remodel contractor in Barnstable has landed on the Remodeling Magazine Big 50 list of the country’s renovation contractors who are at the forefront of their fields. Among several awards from NARI, Encore Construction earned a Contractor of the Year Silver Award for Best Residential Kitchen under $50,000. Encore Construction operates showrooms on Cape Cod and in Sudbury, offering kitchen renovation services throughout the Cape and the greater Boston area. By offering design, construction management, and remodel services, the firm creates a streamlined, more cost-effective process for clients. Cape Cod and Boston MetroWest homeowners who work with the firm maintain a single point of contact throughout the project, cutting down on budget and schedule-busting miscommunications. Taking customer service to its most practical ends, Encore Construction utilizes Build Clean technologies to significantly reduce airborne dust on-site. Mitchell Construction Group is an expert design and build firm specializing in kitchen remodeling and outdoor kitchen construction. A Remodeling Magazine Big 50 general contractor and recipient of the Eastern Massachusetts National Association of the Remodeling Industry Customer Satisfaction Award, the firm was established by company President and Owner Tom Mitchell in 1987. Over 30 years later, the Certified Green Builder and Licensed Construction Supervisor has garnered PRISM awards from the Builders and Remodelers Association of Greater Boston, a Chrysalis award for remodeling excellence, and the distinction of Regional Contractor of the Year. Boston magazine called the firm the Best Kitchen & Bath Contractor in western Boston. A Mitchell Construction Group kitchen renovation in Brookline earned a Gold Award from the Eastern Massachusetts chapter of the National Association of the Remodeling Industry. The team completed the renovation project in a 1920s Georgian Colonial home. New, custom, white kitchen cabinets lightened the space, especially with touches of leaded glass panes throughout. The 10-foot kitchen island was built from warm-toned walnut and topped with white and gray Caesarstone countertops. CEO David Supple founded New England Design and Construction in 2005 after graduating from the architecture program at Tufts University and honing his skills as an architect and project manager for three years in California. Supple has led the firm in projects worthy of features in New England Home, Boston Home, Design New England, The Boston Globe, Remodeling Magazine. One of the top 50 general contractors in the country according to the Remodeler Magazine annual list, New England Design and Construction performs custom kitchen renovations throughout the greater Boston area. Their work has earned them a spot among the Qualified Remodeler Top 500 firms and Gold and Silver Contractor of the Year awards from the Eastern Massachusetts chapter of the National Association of the Remodeling Industry. President Peter Feinmann established Feinmann Builders in Somerville in 1987, originally working out of his own home. In 2008, the multimillion-dollar business moved from their office at 8 Lee Street to their current location in Lexington. Feinmann stewards the firm with Senior Architect Barney Meier and Project Manager and Home Crew Manager Tammy Russo. In their 30-year history, Feinmann has completed more than 1,200 projects for over 640 clients throughout New England. Feinmann has earned multiple PRISM and Chrysalis Awards, a Regional NARI Award, national NARI recognition for a historical renovation/restoration project in Cambridge, and more than 70 other accolades for design and build projects of all sizes. To recognize the hard work of their 20-person team, Professional Remodeler Magazine called Feinmann a Market Leader. The update of a Tudor in Newtown earned Feinmann a Gold PRISM Award for Best Remodeling/Restoration Under $250k. In the kitchen, the firm employed stainless steel appliances, Galaxy granite countertops, and vertical grain cabinets to create a warm and modern aesthetic. The peninsula is stepped to provide surfaces for kitchen prep and homework.